Hi there, and thanks for reading! This our very first post on our brand new blog here at MecSoft. We look forward to the potential this blog has to better reach our customers, prospective customers, partners, resellers, and general industry professionals. We wanted to write this post to tell you a little bit about this blog, and what you can expect from us here. The first thing that we are committing to do with this blog, is regular submissions. In business today, the only thing worse than not having a company blog, is having a blog that doesn’t get updated. The internet has given society an avenue to distribute content quickly, and inexpensively, so who wants to see old stale content when they land on a company website or blog? The answer is no one! And that’s the reason why we have committed to keeping this blog updated regularly, on a weekly basis. The second thing we are committing to do here is give our readers content that matters. What is “content that matters”? I’ll start by explaining what it’s not. It’s not article after article about MecSoft news and information, although there will be some of that. It’s not consistent articles about the individual features of our products (may be a little of that too). It’s articles that will hopefully keep you coming back to see what’s happening not only in our world here at MecSoft, but in the CAD/CAM and manufacturing industry at large. We’re going to do our best to bring you content about anything from 3D Printing in manufacturing, to what SolidWorks has in their next release, to showing you brilliant design using CAD/CAM. We also welcome guest articles from our readers! 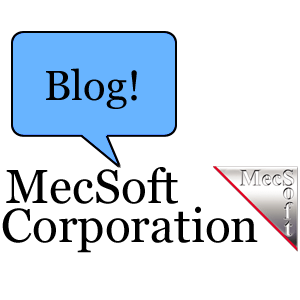 If you have an article to contribute, or have photos to share (especially if you used a MecSoft product) we would love to feature it here at MecSoft The Blog. Just send your articles or photos to blog@mecsoft.com to be considered! We hope this gives you a little bit of insight into this new blog, so now it’s time to read our first “real post” from our CEO of MecSoft, Joe Anand.